Saturday Delhi NCR seen getting overcast..Radar shows cloud cover increasing and region gearing up for afternoon precipitation..Mungeshpur has recorded 36 mms and Ayanager 7 mms. Saturday/Sunday forecast on Current Weather Page (to give preference to this article below). A New Dimension has been added to Meteorology in the last 20 years.Sprites, A fresh and newly found phenomena, hitherto unknown to us , was discovered as early as 1989.And was systematically imaged and studies carried out only after the satellites were able to locate the sprites. The first color image of one wasn’t taken until 1994. 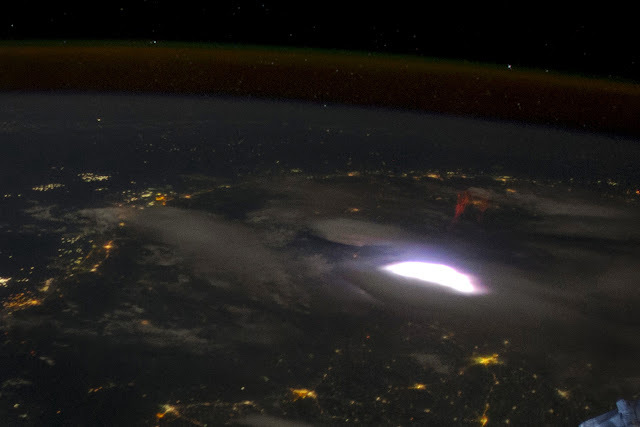 Back on April 30, Expedition 31 astronauts aboard the ISS captured this photo of a red sprite hovering above a bright flash of lightning over Myanmar. Elusive atmospheric phenomena, sprites are extremely brief bursts of electromagnetic activity that are associated with powerful lightning discharges, but exactly how and why they form isn’t yet known — although recent research (along with some incredible high-speed video) is shedding new light on sprites. So-named because of their elusive nature, sprites appear as several clusters of red tendrils above a lighting flash followed by a breakup into smaller streaks, often extending as high as 55 miles (90 km) into the atmosphere. The brightest region of a sprite is typically seen at altitudes of 40-45 miles (65-75 km). 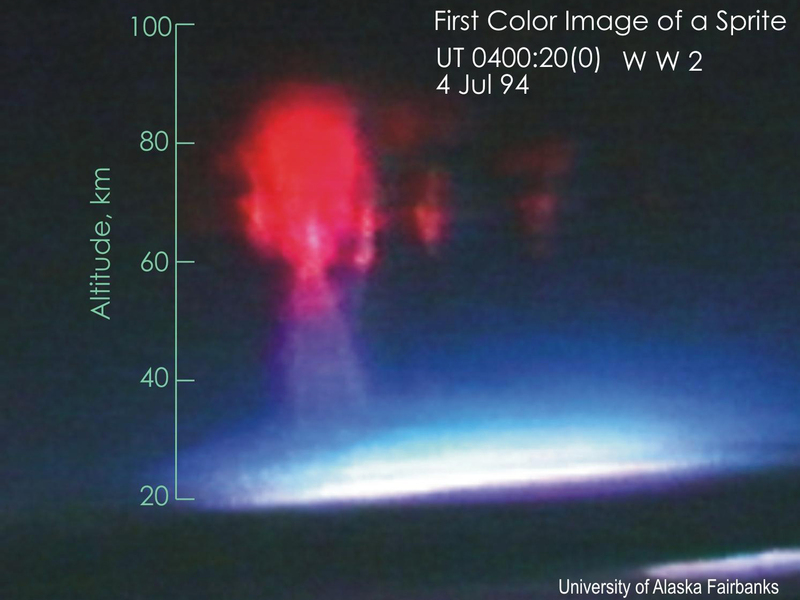 Because they occur above storms, only last for a thousandth of a second and emit light in the red portion of the visible spectrum (to which our eyes are the least sensitive) studying sprites has been notoriously difficult for atmospheric scientists. Space Station residents may get great views but they have lots of other things to do in the course of their day besides sprite hunting! Luckily, a team of scientists were able to capture some unprecedented videos of sprites from airplanes in the summer of 2011, using high-speed cameras and help from Japan’s NHK television. Based on the latest research, it’s suggested that sprites form as a result of a positive electrical charge within a lightning strike that reaches the ground, which leaves the top of the cloud negatively charged — a one-in-ten chance that then makes conditions above the cloud “just right” for a sprite to form higher in the atmosphere. Image from Science and Analysis Laboratory, NASA Johnson Space Center,nset image: the first color image of a sprite (NASA/UAF.) Video: NHK. By Jason Major, Universe Today. Watched an episode on sprites at discovery channel nearly an year ago. @rajesh 35c ?? ?but at panvel it wud be close to 33 c!!! but the real feel was much higher !! !when will the the wet phase of mjo begin?? 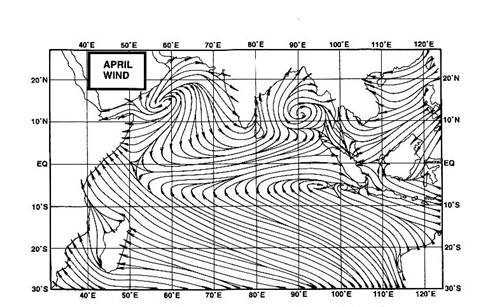 ?any sign of off shore trough strengtening?? ?its quite hot and muggy all along the west coast!!! junaid:Mumbai colaba was 33c and vagaries 35c today. Real feel 37c as humidity was lower at 57% here.West coast trough getting better from Monday..but will inform in Sunday post. Very nice research of sprite above lightening flashes ! Thanks Abhijit, Vivek and Ron. @Ron: Might as well write something as there is no activity here in Mumbai (weather wise). Villipuram, Ariyalur, Perambalur, Dharmapuri, Karur, Salem and Sivaganga districts gets bountiful rains. No rain in Chennai region for 4th Consecutive day. Raining here in ghaziabad from the past 10 minutes. Raining in Gurgaon since 10am. Fairly heavy rain. Today the rain is lighter than the previous days and has stopped now. But the sky is still overcast. Just now localized brief heavy spell in Badlapur from WNW direction. 11mm rain measured in 20mins. Sky is very dark now but still no rain. Tamil Nadu is now in Normal Category for SWM 2012. The deficiency is only 18%. Yesterday’s rain was the second highest for Tamil Nadu in this SWM. Very overcast here in Gurgaon all afternoon. No rain though. It rained in the morning. Thanks Rajan sir- Rains are very much required. Myself happy for tree plantations with saytrees.com. This rain is nothing - problem being with Bangalore infrastructure which cannot take even take 10min of rain. Ground water is zero, can be traced if dug more than 5000ft (electronic city...no water)- every drop is useful and it has to rain atleast 500mm more. Now total from june-aug is just 200mm. Many places like Mysore,Mandya,Bellary,rayalseema are still below 50mm!!! Other reader may pass comments on me- no issues. Myself having seen old Bangalore 20years back and current state cannot hold back detoriation. Rajan/Pradeep - I have noticed it rains in Bangalore only if day time is very hot, night thunder clouds develope (convection effect). It does not rain during normal monsoon months like july,june - when lots of clouds are present in daytime but winds drive away. Why is it so?? Pradeep Gujarat may have got less rain unlike previous 5years where it was more than exceess. Now Rajisthan is becoming very good. Anonymous pls do not worry-next 3 months I will be back to beautiful NAVI MUMBAI. No Pradeep Sir - I am always okay- infact deep respect to you/Rajesh/Rajan - your knowledge about weather models, explanation with weather terminologies always makes me good. Heavy rain lashes parts of Chennai. Surprisingly nungambakkam observatory missed out big time. sset: All cities are getting urbanised. Lots of greenery is lost, and cities feel "the heat" of the concrete jungle.That why, temps outsde the city ,in open areas is always less, that is cooler, than proper city regions.Urban Warming..